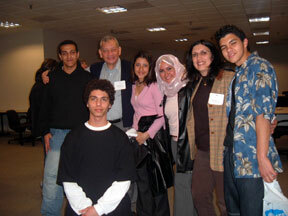 The author, Ahmed Heiba (far left, back) poses with other exchange students who are living in Washington, DC and Maryland. Exchange students travel from their countries to other countries to learn a lot of things they may never have heard about before. They want to know the way people in the other countries think, the difference between their countries and the others in the world, and the way they live. They also hope to correct some wrong information that the people in the other countries think about their country or their religion. These students travel to other countries when they are young because when they get older they might have important jobs. Exchange students are important because they can help create better understanding between the countries. Maybe some day this may stop wars between countries. Unfortunately exchange students have some problems in their host countries, like problems with schools, with host families, with the language, homesickness, cultural shock, and other things. One big problem I have in school is I am often late to school. In the U.S. my school begins at 7:25 a.m. but I am used to waking up for my school in Egypt at about 8:00 a.m. It’s too hard for me to wake up at 6:30 a.m. here. I think I went to the school just two or three days on time. I think my grades will drop because I am always late, however I need these grades to pass this year because, even though I will take this year again in Egypt, I can’t fail this year here because I’m on a program called YES program (Youth Exchange and Study program} and they would give me a big punishment. There are some exchange students who are doing very well in the schools, but others stay doing homework all the day, then study for tests, then go to sleep. “I hate the school here because they give me a lot of homework and I feel that I’m wasting my time like that,” one Egyptian exchange student said. Exchange students should also see other people and talk to them. If they will get good grades, but then go back home without any experience, only good grades, then the experience isn’t the best for them. Some exchange students have problems in finding good host families. “I changed my family four times because they weren’t a ‘host’ family, but they were a ‘welcome’ family,” Bedo Elsayed said. Bedo explained that a “welcome” family wants to try to be “host” family, but not for a long time, just for days or maybe weeks. Some exchange students would like to have a job, but they need permission for this job and it’s too hard to get this permission for them from the government. To help us with spending money, Egyptian exchange students get about $125 from the program each month. But a lot of exchange students want the government to give them the permission to work because they want to make more money and also they don’t want to be dependent on somebody else. “It’s really important for us. We could feel completely responsible in everything,” said Wafa Ali, an exchange student from Egypt. Instead they have to work at jobs like babysitting, cleaning snow, cutting grass so they can take cash money from it. But it’s also hard for them to get these jobs and it’s sometimes hard to do them if some gets a job. Nermeen Mahmoud, an exchange student from Egypt, tried babysitting just one time, but she found that it’s not the same as in Egypt. “It’s totally different. I’ll never do it again here,” she said. Because exchange students have a lot of problems, the exchange programs have a lot of volunteers who help the exchange students to solve their problems. The volunteers help a lot of exchange students in a lot of problems. It’s impossible for them to solve all of the problems, but they can help the student understand them and deal with them. Oksana, an exchange student from the Ukraine, tries to solve her problems by herself. “All the exchange students knew before, that they were going to have problems, so they have to adjust with everything here and solve their problems by themselves,” she said. Oksana had a lot of problems here in America. “I used to see a gloomy face from my 14-year-old host sister everyday,” she said, but she learned how to live with it. Even though there are problems, exchange programs are really important for everybody and some Egyptian exchange students hope to be host brothers or sisters for an exchange student from America. “My own family in Egypt is hosting a girl from Switzerland,” Aya Ashraf said. For me, I want to be a host brother for an American person because now I have experience in the problems of exchange students, so I’ll know that person’s problems and I’ll be able to help him or her. With all of their problems, exchange student programs still do good things for students and countries. Exchange students come to the U.S. with open minds so they listen to people and some of them change a lot of their thinking. For me, I never liked Jewish people before, but now I have about three Jewish friends who may be best friends. Before I thought that all of them were bad people, but I discovered that I was wrong.